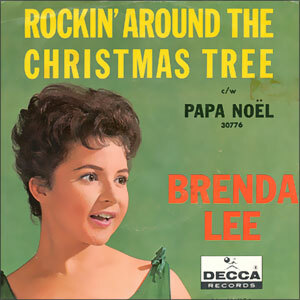 Despite her mature-sounding voice, Brenda Lee recorded this song when she was only 13 years old. Despite the song’s title, its instrumentation also fits the country music genre, which Brenda Lee more fully embraced as her career evolved. The recording features Hank Garland’s ringing guitar and Boots Randolph’s swinging solo sax break. An instrumental version of the song appears as background music in the 1964 television special Rudolph the Red-Nosed Reindeer, which exclusively featured music written by Marks. It can be heard in the scene where Rudolph first arrives at the Reindeer Games and meets another reindeer named Fireball. The song was also used in the 1990 film Home Alone during a scene when Kevin McCallister pretends that there is a holiday party taking place in his house, and discourages the burglars from robbing it.